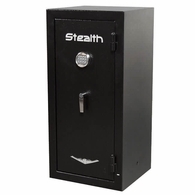 The Stealth Home Safe Series is built to the highest quality standards with an all Steel 12 Gauge Door and Body and Seven 1.25" Solid Steel Locking Bolts. 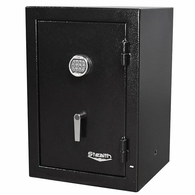 In addition to the top notch security, Stealth's UL Home and Office Safe Line comes with a 1 hour fire rating at 1200°. This ensures your valuables stay safe and cool inside with the interior temperature never passing 350 degrees F.
The NL lock is considered the most reliable lock in the industry. It's UL approved as a Type 1 High Security Electronic Lock. It also has a red light that makes entering your combination easy in the dark. 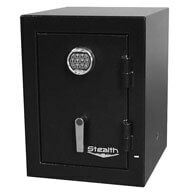 Stealth Home Safes are built super tough with a 4" Thick Door that makes the safe extremely pry resistant. The Steel in the front of the door is folded over to make it 1.25" Thick. Good luck getting any sort of leverage on this safe! The included Electrical Outlet Kit has 3 spots for plugs and 2 USB slots so you can run a dehumidifier and charge all of your Electronics while safely stored inside the safe. The Molle Organizer makes adding and replacing accessories a breeze. Store your documents, passport and small objects in the included pockets and free up space in your safe. Easily open and close your safe with the beautiful Chrome L Shaped Handle. Easily store more items in your safe with the two adjustable shelves. The all fabric interior will prevent damage or scratches to your prized possessions. 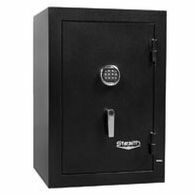 The External Hinges allow for your safe to open a full 180 Degrees giving you full access to your safes interior. 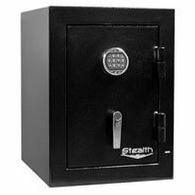 Secure your safe with the included bolt down hardware and 4 bolt down holes. Then cover the holes up with the included plastic caps.